What Is Flagyl and How Does It Benefit Us? Flagyl is an antibiotic used to treat bacterial infections. But do you know how to use Flagyl properly? And what side effects and interactions it may have? Flagyl is an antibiotic used to kill bacteria causing infections in the body. As this medication takes effect, it is likely that you will start to feel better before the end of your prescription. In order to ensure that the bacteria have been sufficiently eliminated from your body, it is essential to take Flagyl consistently and to the end of your prescription period. Your doctor will give you the appropriate instructions for this based on the nature and severity of your infection. Some age groups and groups with medical conditions such as liver disease may not be able to take full sized doses of Flagyl. Talk with your doctor about any potential risks before using this medication. Flagyl is the brand name for metronidazole, an antibiotic that is used to treat abdominal infections, skin and other tissue infections, bone or joint infections, gynecologic infections or respiratory infections. Flagyl is given as a tablet that is to be taken orally with a full glass of water. This medication can be taken with or without food. Doses should be taken around the same time every day to help the patient remember their dose and to help avoid an excessive amount of the medication from being in your system at any one time. If you forget a dose, take it as soon as you remember unless it is close to the point where you should take your next dose. Do not double up doses to make up for those which have been missed. What Are the Proper Dosage of Flagyl for You? The dosing and administration of this medication is largely based on the nature of the infection and the severity of the patient's condition. 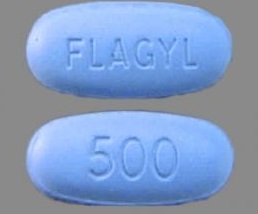 Flagyl tablets come in 250 and 500mg sizes. In most cases, patients are given 250mg three times a day for one week. Single day doses are given in divided doses of one gram each. Those treating amebiasis will be given 750mg three times a day for 5-10 days. Children with this condition will be given 35-50mg a day in three divided doses for up to 10 days. Dosing size will be based on the child's weight. When treating anaerobic bacterial infections, adults will be given approximately 500mg every six hours, with doses not exceeding 4g in a 24 hour period. In most cases these doses will be given for 7-10 days. Children suffering from this condition will be given a dose based on their weight, often 7.5mg for every kilogram of body weight. Those who suffer from seizures, epilepsy, liver disease or stomach or intestinal disorders may not be able to take a full dose of Flagyl as the medication could impact treatments for these conditions, making your body unable to clear the drug from your system properly. Talk with your doctor if you have these conditions so you can determine what level of medication is right for you. Elderly patients at risk have also seen an increased risk of renal failure when using Flagyl. It is highly recommended that patients in this age group are given a lower dose and monitored regularly throughout their treatment to ensure that a negative reaction does not occur. Flagyl is in pregnancy category B meaning that it is usually safe to take this medication while you are pregnant, but you should check with your doctor to ensure that any potential risk is outweighed by the foreseen benefits. However, it may not be safe to use Flagyl while breastfeeding. This drug may cause an unsafe reaction to your infant, so talk to your doctor about this risk before starting on this medication. The most common side effects associated with Flagyl include headaches which occur in 18 percent of users, vaginal irritation or infection in up to 15 percent of users, nausea in 10 percent, metallic taste in the mouth in up to 9 percent, bacterial infections in up to 7 percent, and flu symptoms in 6 percent of users. These side effects are not serious, but should be reported to your doctor in case you need additional care to cure these infections or an adjustment in your dosage size. Other side effects, occurring in 2-5 percent of users, include genital itching, runny or stuffy nose,dry mouth, abdominal pain, dizziness, sore throat, diarrhea, upper respiratory tract infections, vaginal yeast infections, sinus infection, painful menstrual periods, urinary tract infections and constipation. In less common cases, patients have reported "furry" tongue and canker sores. Report these side effects to your doctor to determine how best to treat your condition and to determine whether or not you should continue taking your current dosage of Flagyl. If you begin to experience unexplained rash, hives, itching, unexplained swelling, most notably in the lips, throat or mouth, or wheezing and breathing problems after taking your prescription it is likely that you are suffering from an allergic reaction to Flagyl. Contact emergency medical services immediately to get help. Can Flagyl Interact with Other Things? You should not drink alcohol while using Flagyl. This can significantly increase the chance of developing nausea during the course of your prescription. If you have mixed Flagyl and alcohol and you begin to experience severe nausea, vomiting, flushing, headache or digestive upset, this can be a sign of a dangerous interaction that requires medical attention as soon as possible. Alcohol consumption also refers to the alcohol content that may be in some medications, such as over the counter cold and flu remedies. Medications known to interact with Flagyl include amprenavir, barbiturates, carbamazepine, cimetidine, disulfiram, fluorouracil, lithium, methadone, phenytoin, ramelteon, sirolimus, tacrolimus, and warfarin. Inform your doctor regarding any medications you are currently taking, including over the counter drugs and supplements to help avoid a negative reaction while you are using Flagyl. What Does the Rash Caused by Meningitis Look Like?